*Sessions at 5, 6, or 7 PM on Mondays, Wednesdays, Fridays**All packages / sessions must be used by August 31st, 2018. THE ULTIMATE TRAINING EQUIPMENT FOR IMPROVING PLAYERS' SKATING STRIDE, SPEED AND TECHNIQUE. The key to BLADE training is the controlled atmosphere. Coaches and trainers can easily communicate with skaters, providing constant instruction, evaluation and feedback to get results. 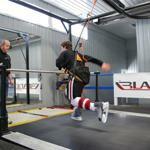 Drop us a Mail: info@impactpst.com for more information on Our Off- Ice and Treadmill Training Programs.